We help your business to receive payments online. Payment Gateways are online credit card validation and processing system that allows vendors to sell their products and services online. Agasoft has helped businesses to accept payments online. We at AGASOFT have tried and tested many Payment Gateway provides and have chosen the best in terms of security, stability, cost and peace of mind. Our aim is to provide Payment Gateways at the lowest possible cost so that Small and Medium Businesses can harness the full potential of Internet. At Agasoft we integrate the right payment gateway solution for your business needs. CCAvenue is South Asia's largest payment gateway solution powering 85% of eMerchants in India with real time, multi-currency, multiple payment options online payment processing services. 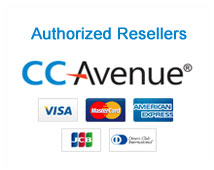 CCAvenue is the only complete PG solution in the region that has the unique ability to offer the full spectrum of Internet payment options. TechProcess prides itself as one of India’s leading payment solutions and services companies. It represents a perfect amalgamation of expertise, resources and opportunities, one that is trusted by some of the most respected brands in corporate India. From large utilities and e-commerce portals to telecoms, banks and finance companies. Get more customers, Get more business Call us now !